Project essay for Darren Banks’ Palace Band-Wagon at FIAC 2010. Read my interview with Banks on Lux. 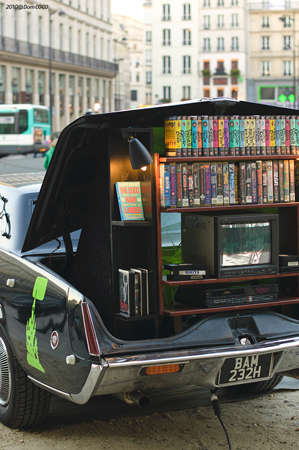 Parked in the Cour Carrée entrance of FIAC 2010, Darren Banks’ (UK) temporary horror cinema Palace Band-Wagon brings heyday of the videocassette back to life. This is the ‘mobile cinema’ version of The Palace Collection, an evolving installation that negotiates collective horror history, effects of new technology, modes of distribution, and ideas on the collection. Housed in a 1970 Cadillac Eldorado that comes equipped with a television and a VCR, the public can choose continuous screenings of horror video classics such asEvil Dead, Brain Damage, and The Hills Have Eyes from Bank’s personal collection. This video collection consists of films distributed by Britain’s infamous Palace Pictures in the 1980s and have been tirelessly procured by Banks from Ebay, boot fairs, and charity shops. Darren Banks has given the overwhelming history of horror film a more approachable feel by focusing solely on Palace Pictures and their subsidiary companies of horror video (Palace also worked in comedy, thrillers, action, and music videos). Infamously, the Palace Picture Distribution and Production Company was a seminal distributor for cult cinema and international art films established by Stephen Woolley & Nik Powell in London (circa 1982). As part of the part of the decade’s legendary VHS and Betamax market boom, the innovative marketing strategies and schrewdness in securing film rights for Palace Video continue Palace Pictures’ legacy long after they declared bankruptcy in 1992. With The Palace Collection Banks re-ignites the personal power of the audience and the fetishization of cult cinema. In the 1980s, videocassettes facilitated film’s literal movement out of the cinema and into private realms, bringing movies to the people. The invention of the VCR allowed for personal home viewing that ignited a functional shift in the industry and sparked debates, particularly in the United Kingdom, about censorship. Simultaneously in Ghana (West Africa), a mobile cinema project brought impromptu screenings to isolated communities. Running TVs and VCRs on power generators the movies were mostly B-movie or horror movies like Cujo, Evil Dead, and Eaten Alive. The accompanying hand-painted promotional posters were often commissioned without the artist seeing the film but fostered a creative interpretation often exceeding the film’s content. Inspired by this, Banks is hosting a poster-painting workshop at FIAC where viewers can create artworks based on the selected films and add to the video archive. Palace Pictures’ downfall symbolizes the slow erasure of VHS and the perceived decline of the horror movie through excessive use of CGI and advanced technology. Treating his Palace videos as ephemera, Banks challenges the preciousness of the collection by placing it on public display as a useable resource. By provoking the audience to use outdated materials and to be selective in doing so, Darren Banks positions The Palace Collectionand now Palace Band-Wagon as a readymade gesture urging the audience to remember the ‘just forgotten’ and the ‘recently redundant’.